Baker Mayfield reminds me of Johnny Manziel. I state that meaning beyond the fact they are short quarterbacks that won the Heisman Trophy thanks to 4,000-yard passing seasons inflated by a spread offense. But that’s not all. They also share tasteless gesticulating and showboating of opponents on the field and bad-boy behavior off the field. Without the platform their Power 5 universities provided them, they’d be another short quarterback with ridiculous stats. Similar stats are otherwise easily dismissed when compiled by undersized QBs at mid-major schools. Mayfield and Manziel would be more Mason Fine than a Heisman Trophy winner. Who is Mason Fine? He’s North Texas’ 5-foot-11, 180-pound quarterback that threw for a ridiculous number of yards last season at a Southwestern college (4,052). All of the above apply to both Manziel (6-0, 180) and Mayfield (6-1, 220). Manziel doesn’t win the 2012 Heisman without wearing his Texas A&M uniform; same with Mayfield and the 2017 Heisman sans Oklahoma’s brand. Plug Fine into the serendipitous position Manziel found at Texas A&M and Mayfield at Oklahoma and maybe those ridiculous numbers could have propelled Fine from nobody to Heisman candidate. This is not a knock against Fine. From what I’ve seen and heard of Fine, he’s a talented yet humble kid. He’s content with his overachiever label and opportunity at a Group of 5 college. Fine can wing that ball, but he’s dismissed because he puts up numbers for North Texas rather than Oklahoma or Texas A&M. Instead, it’s a knock against NCAA critics that think Manziel should have been allowed to exploit the system to earn money off autographs of jerseys, footballs and photos. I make this point to refute the trending opinion star players are worth more to their university than the school to them. They believe the athlete should be permitted to make money off autographed photos, footballs and jerseys. Also, that they deserve our sympathy for being exploited by the system. Selling autographs was how Manziel ran afoul of the NCAA. Having won the 2012 Heisman as a redshirt freshman, he had another year of college to play before he was three years removed from high school and thus eligible for the NFL Draft. He was meeting secretly in hotel rooms with dubious sports memorabilia characters to sign photos, footballs and jerseys for cash in his pocket. Once the scheme was exposed, he was suspended the first half of the 2013 season opener. The NCAA faces a no-win situation to prevent agents, unscrupulous coaches and boosters (for the latest example, see Ole Miss football, coach Hugh Freeze and his cronies) from taking advantage of loopholes. At the time Manziel was secretly cashing in, college basketball commentator Jay Bilas, a continual critic of the NCAA, tweeted a photo of Texas A&M’s website selling Manziel jerseys. He essentially asked why the university is able to profit from Manziel’s name without Manziel receiving a slice. The tweet went viral, garnering sympathy for Manziel. The belief of Bilas and his ilk that NCAA money should funneled to the elite disregards all the "working-stiff" male and female athletes training equally as hard (certainly harder than Manziel's work ethic) in non-revenue sports. In many ways, it corresponds to a tax cut for the rich. Those critics of the NCAA overlook that without Texas A&M’s brand, Manziel was Mason Fine. It’s the reality that Fine’s numbers in a North Texas uniform weren’t worth Manziel’s in a Texas A&M’s colors. The same is true of Mayfield, with added evidence. 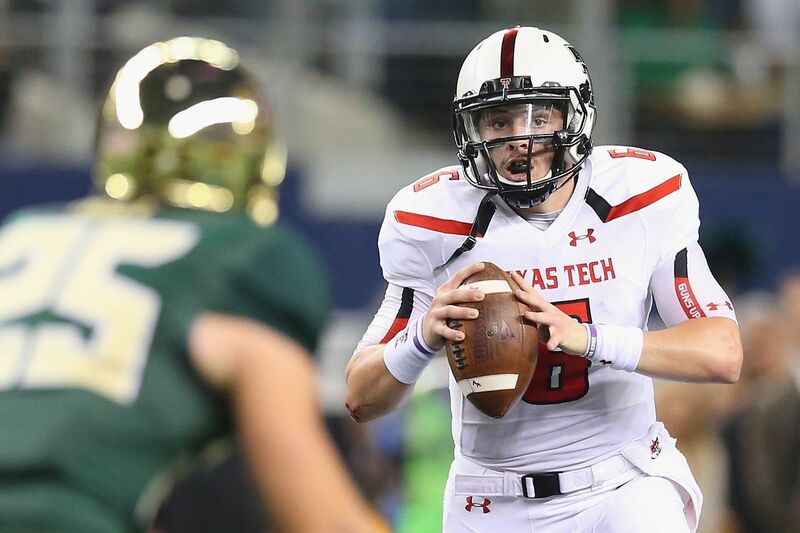 Who was Mayfield when he threw for 2,317 yards in seven starts (a pace worth 3,400) as a true freshman on 2013 at Texas Tech? He was Mason Fine. As the story goes, then-Oklahoma coach Bob Stoops didn’t know Mayfield had transferred as a walk-on to the Norman campus. Coming out of high school, Mayfield was a three-star prospect, but his only offers were from Florida Atlantic, Rice and Washington State. He no doubt could have thrown for ridiculous numbers at those schools, but he would still have been Mason Fine. Washington State’s Luke Falk threw for 4,468 yards in 2016 and 3,593 while missing the Holiday Bowl. Did you see Falk invited to New York as a Heisman finalist? Something else to remember about Manziel was he originally verbally committed to Oregon in the same class as Marcus Mariota, the 2014 Heisman winner as a redshirt junior. If Manziel stuck with Oregon, does he see the field? Based on their NFL potential, that’s an affirmative no. The bigger Mariota (6-4, 215) was the second pick of the 2015 draft and is a third-year starter with the Tennessee Titans -- not to mention a team player. Manziel was a bust as the 22nd pick of the 2013 draft by the Cleveland Browns. He has been out of the league three seasons. He’s hoping for a comeback in the Canadian Football League (maybe he’ll face Mason Fine someday). Mayfield, though, may have more NFL potential than Manziel. I learned that from Steve Logan, a former NFL quarterbacks coach and East Carolina head coach for 11 seasons that has a sports radio show on WRAL in Raleigh, N.C. Logan says Mayfield has an NFL future. He can read defenses better than most spread option quarterbacks. But that doesn’t change the fact Oklahoma’s jersey was worth more to Mayfield than Mayfield’s value to Oklahoma football.